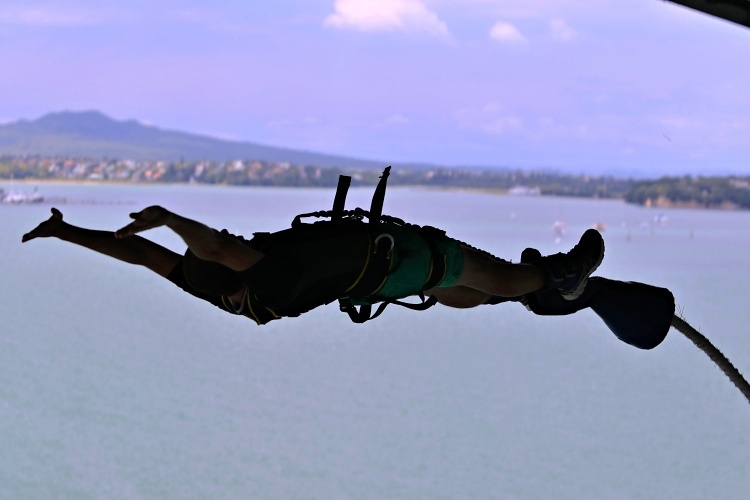 When we decided to go on our second road trip in New Zealand, which is the birthplace of commercial bungee jumping, we knew that it was a great opportunity to do our first bungee jump. It was a good idea but it proved to be much harder than we thought in the end. You might be confused with the words ‘bungee’ and ‘bungy’. They mean the same thing, but the ‘bungy’ spelling is used mainly in New Zealand, and ‘bungee’ in the rest of the world. We have done all our jumps in New Zealand so far so that’s why all the mentioned jumping sites include ‘bungy’ in their names. 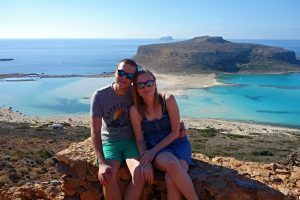 This article has been written from Petr’s perspective as Kat had already written about her first bungee experience – you can read it here. Petr is sharing his own experience to explain what to expect if you decide to do it for the first time. This post includes many useful tips that will help you to make your first jump easier. Queenstown is considered the adventure capital of the world so many people try bungee jumping here. 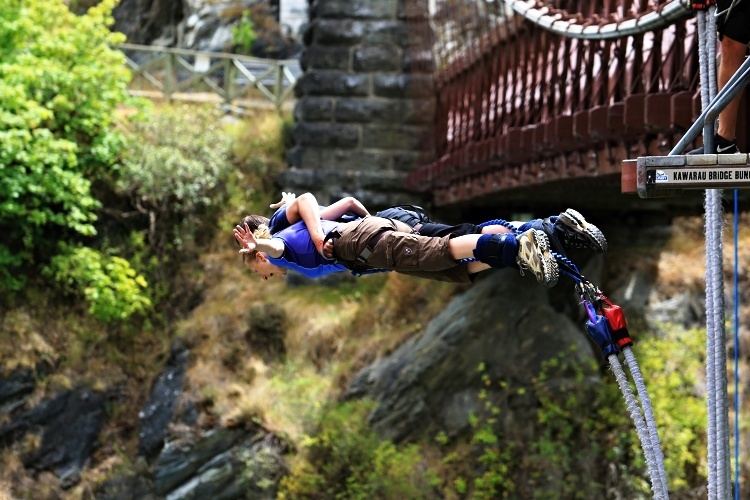 There are three jumping spots in Queenstown – the Kawarau Bridge, Ledge and Nevis – and each of them is unique. 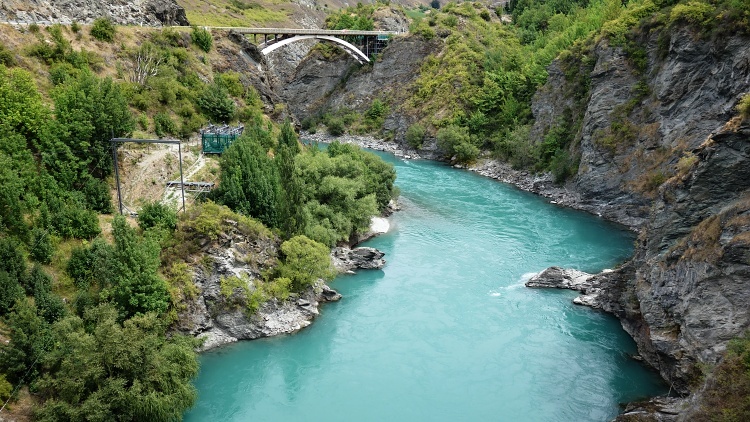 The Kawarau Bridge Bungy is the world’s first commercial bungee jumping site, which has been operated since 1988, so it was an obvious first choice for us. 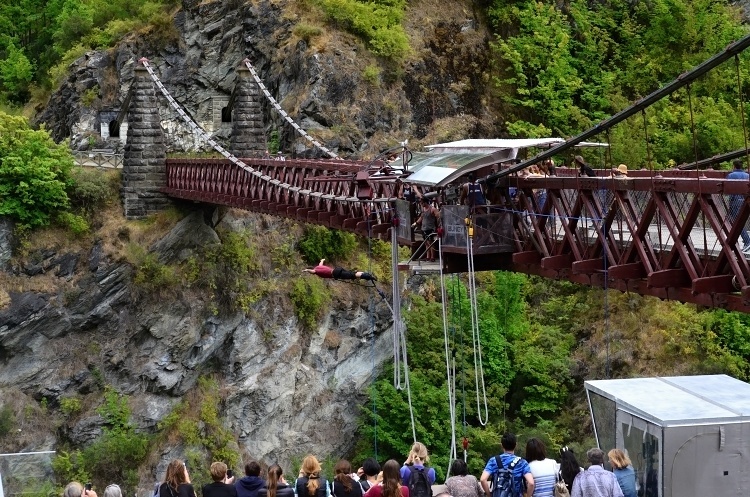 This 43-metre (141-feet) bungee jump off the historic Kawarau Bridge is the only place in Queenstown that allows tandem jumps and water touches are also available. 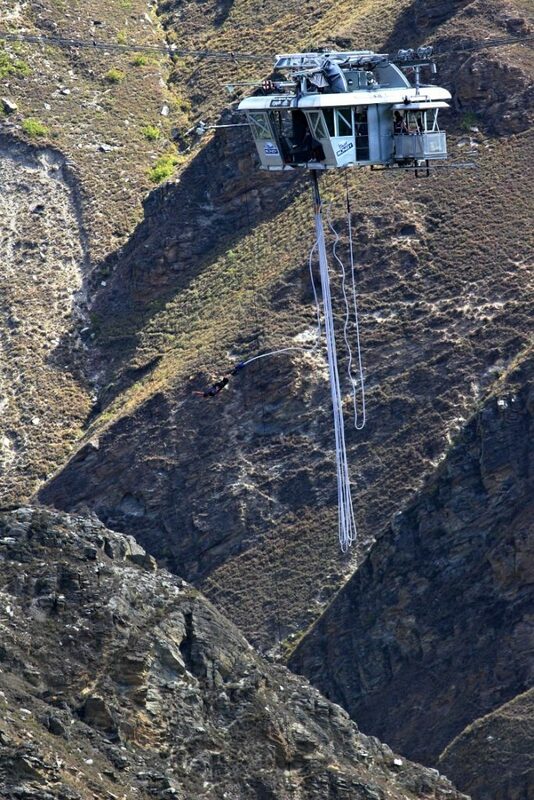 They say that if you haven’t been to the Kawarau Bridge Bungy Centre you haven’t been to Queenstown. We couldn’t agree more! 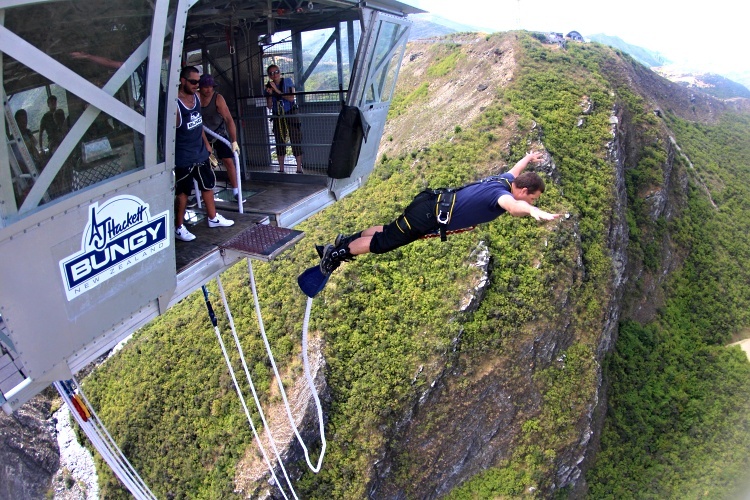 The Ledge Bungy, which is situated 400 metres (1,312 feet) above Queenstown, offers great views of the city. Thanks to specially designed harnesses you can use your imagination (if you dare) and try various jumping styles such as twists, flips, ‘Matrix’, etc., which you can choose from their ‘Jump Menu’. It’s the only site in New Zealand where you can jump at night (in winter only). We had to skip this site because of lack of time. 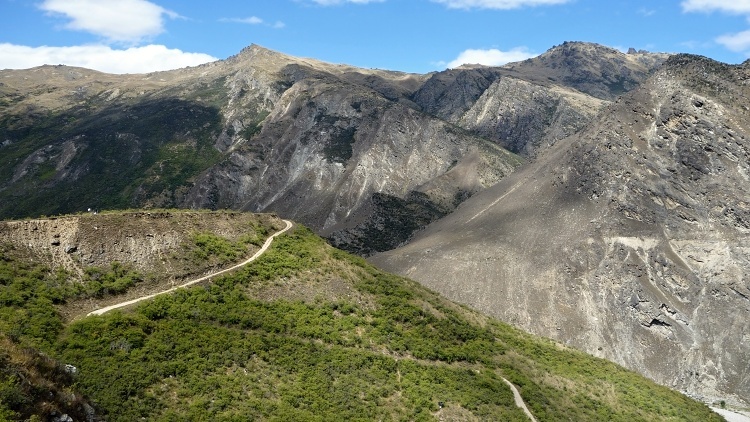 The Nevis is the highest bungee jump in New Zealand (134 metres/440 feet) and is the most challenging out of the three sites in Queenstown. The location is spectacular – people jump from a cable car cabin hanging on high wires stretched above the Nevis River winding along the valley floor. The jumping cabin is constantly moving, which makes the jump even scarier and the free fall takes a long 8.5 seconds. All the three sites belong to AJ Hackett Bungy New Zealand, which allows you to combine the jumps and get a better deal if you jump more than once. We arrived in Queenstown after a long drive from Te Anau. It was late afternoon so we decided to visit the Kawarau Bridge Bungy Site first to see what lay ahead of us. The Kawarau Bridge is a very popular place. It’s set in the beautiful Kawarau Gorge – an old wooden bridge surrounded by steep rocky walls with the turquoise river running underneath. We watched from the viewing platform for a while as people jumped. It was fascinating to see all of them, who didn’t look like crazy adrenaline junkies at all, overcome their fears and jump off the bridge. We were positively charged and ready for our bungee adventure the following day. The next day came and here I was – standing on the viewing platform and watching people jumping again. I could see the emotions on their faces before they jumped off the bridge – it was a mixture of fear, thrill, excitement and anxiety. But when they came back after the jump they all looked so happy, proud and relieved. I was ready but Kat wasn’t yet so we decided that I would jump on my own first and we would see how it went. I was lucky and even though the tickets were sold out online for the day, I got a spot in 30 minutes. I had a feeling that it would be a once-in-a-lifetime experience so I went for the full package including professional photos, video and t-shirt. Everything was paid for and signed, my weight taken and double-checked, and I was ready to rock. The bungee centre is very well designed and there are many screens inside the building where you can watch all the action on the bridge and pass some time before it’s your turn. Finally, my time had come. Oh, yeah! Adrenaline was already rushing in as I made my way to the jumping platform. I put on my harness and got in the queue. Yep, people really are queuing for jumps here. Suddenly it was my turn and I got strapped and double checked. The staff were great and they tried to put me at ease with some jokes. I was ready to go and I slowly began making my way to the end of the jumping platform – my heart was racing and the nerves fully kicked in now. The last few steps to the edge were not easy at all. When I first looked down at the end of the board, it felt much higher than it had seemed from the viewing platform. I jumped and in the blink of an eye the gravity kicked in and pulled me down. I was falling for a couple of seconds, I felt free. Then just a couple of bounces up and down and that was it. A small boat came underneath and the staff pulled me down. The last photo was taken and I tried hard to put a smile on my face. It was such a strong experience and I was still a little shaken but happy. Adrenaline was still rushing through me when I walked back to the bungee centre. I had to check the photos and video to believe that I really did it. Yes, I did! 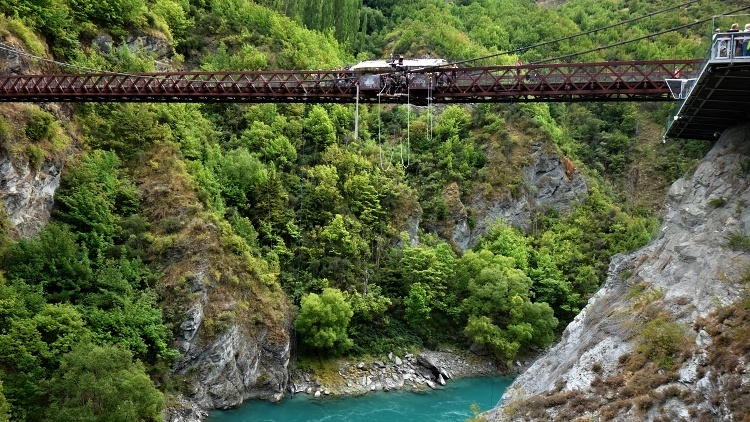 The Kawarau Bridge Centre is the only option if you would like to try a tandem bungee jump in Queenstown. After I did my first solo bungee jump Kat still wasn’t sure if she could manage to jump on her own. She came up with the idea of jumping together to make it easier for her because it would make her feel more comfortable (if that was possible at all!). We enquired with the staff and we got a spot in 45 minutes. I got a discount because it was my second jump. It takes more time to prepare a tandem than a solo jump because it’s more difficult to calculate the optimal length of the ropes, so we had to wait for a while. We managed to jump at the same moment, which made the experience very special, and even though Kat didn’t remember the first few seconds of the fall at all, I could hear her screaming until we reached the water. Then we were bouncing up and down a few times while holding on to each other before the boat picked us up. Then Kat’s happy face said it all as she was thrilled by what she had just done. It was a beautiful moment to share and we recommend it to any couple. It was late afternoon and I was still thinking about doing the third jump – the challenging 134 metres (440 feet) high Nevis Bungy. I was tired and the jumps weren’t cheap but we were leaving Queenstown in a few hours and I knew that we wouldn’t come back for a long time. I checked with the staff and there was still one last spot available at 4 pm so I had to make the decision fast. In the end, I got persuaded by the great discount I received for the third jump with AJ Hackett and I signed up. Kat didn’t want to do it because she was still processing her first jump so she just bought a ticket for spectators. 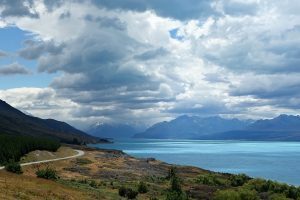 It’s not possible to get to the Nevis Bungy site on your own, as you need to take the four-wheel-drive bus, which collects the jumpers in Queenstown and the Kawarau Bridge Centre. There is also a helicopter option available for those with deep pockets. 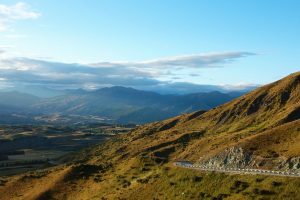 We got on the bus at the Kawarau Bridge Centre, where we left our car – it was just a short drive from there. The drive itself was exciting – the narrow and steep road climbed the mountains and the scenery was spectacular. After arrival, we had to sign the paperwork, put on harnesses and get our weight checked. We were taken outside for a quick briefing and a glimpse of the jumping pod, which is basically a cable car cabin hanging on the ropes that are stretched between two mountains. The view was breathtaking and I could see that many people regretted their decision to jump at this moment. Our group got on the cable car and we started moving towards the jumping pod. The height was a real deal and our faces were saying it all – it was a different level of challenge. 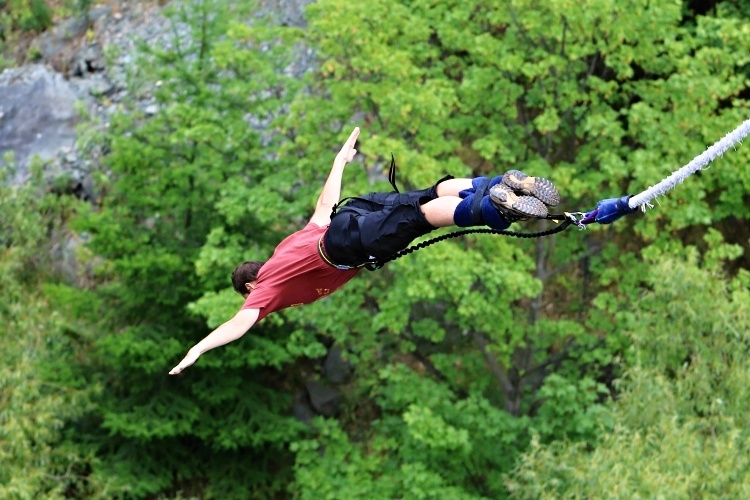 For most people in my group, it was their first bungee jump – so it was a little easier for me. It was exciting to get in the jumping pod because it was constantly moving with the wind as it was only hanging on the ropes. Have I already mentioned that it was really high? People around me were looking nervous but they all managed to jump – one after another. My turn had come and I was seated in a massive chair, which reminded me of a dentist chair, and I started being anxious. The staff checked my harness and rope for the last time and showed me again how to release the cord so that I didn’t come back up hanging upside down. Off I jumped! Wow, it felt crazy to be flying in the air for so long – it took 8.5 seconds of free fall before the rope started to stretch and I stopped falling down. I even had enough time to enjoy the views while the river Nevis underneath was approaching fast. 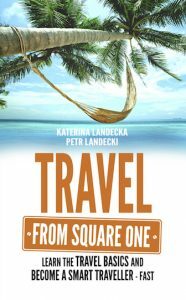 The rope stretched and pulled me up, the first bounce back up was very long – I was afraid that I would crash into the cable car cabin. I released the cord after a few more bounces and moved into a seated position. This was very important because if I didn’t do it I would be pulled back up hanging on the rope upside down, which wouldn’t be very pleasant if you consider that it took a while. Why not jump backwards – just for a change? Kat was determined to jump on her own and we decided to do it on our last day of our trip in Auckland. 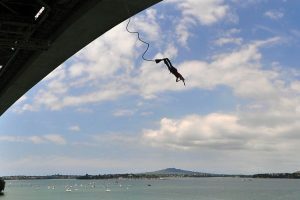 The bungee jumping pod is situated in the middle of the Auckland Harbour Bridge 40 metres (131 feet) above the water. You can be collected by bus in the city centre of Auckland or you can get to the Auckland Harbour Bridge Bungy Centre on your own. At the moment the bridge isn’t accessible to pedestrians so the city views you get while walking under the bridge towards the jumping pod are special. When we reached the pod and the staff opened it to reveal the jumping platform and the views underneath the bridge, everyone in our group was amazed. This time the staff convinced me to try something different so I chose to jump backwards with a water touch – as deep as possible. I had already asked for the water touch at the Kawarau Bridge Bungy but, as this is never guaranteed because of so many factors influencing the trajectory of the jump, I managed to touch the water only by my fingertips. The jump went really well as it was my fourth time and I felt comfortable and had fun. This time they calculated the length of the rope perfectly and I went into the water up to my knees. The deep dive was the highlight for me and I was happy, smiling and soaked when they pulled me back up. Finally, I had got my water touch. Later on, I realised that I had forgotten that my mobile phone was in the pocket of my shorts all the time, but it managed to stay there undamaged during the whole jump. Miracles do happen! Kat enjoyed her first solo jump and went into the water up to her waist – and she loved it. All people in our group managed to jump in the end and most of us dived into the water. This time we really enjoyed the views of the city on the way back. It was a great end to our two-month road trip down under. 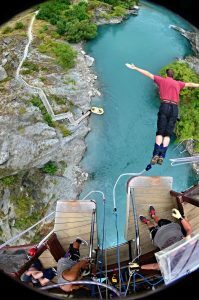 There are three bungee jumping sites in Queenstown – the Kawarau Bridge, Nevis and Ledge. All of them are cool but we chose the Kawarau Bridge because it was the first commercial bungee site in the world, and the Nevis – the highest bungee jump in New Zealand. The Ledge was the least appealing for us but it might be an option if you are looking for something close to the city or you want to try different jumping styles. The Auckland Harbour Bridge is a great alternative if you want to try bungee jumping but you don’t have enough time to travel to Queenstown. It’s also (relatively) less scary to jump above the sea. 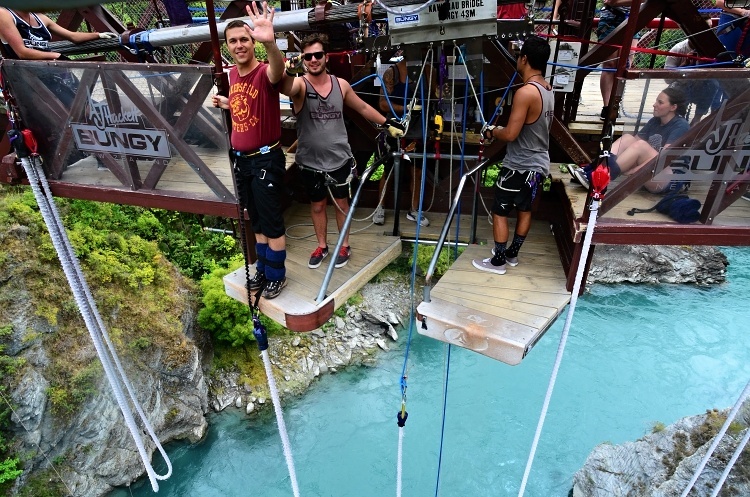 All the four sites belong to AJ Hackett Bungy New Zealand and they provide other choices for those who don’t feel like jumping but would like to try an adrenaline activity. You can choose from a fun zip ride, thrilling swing or bridge climb – each site offers something different. If you purchase more products with AJ Hackett you can avail of a discount, and you can also combine some of the activities into combos to get an even better deal. We recommend buying the packages including photos and/or video to capture this special experience, you can get a discount when buying more packages within one day. A complimentary t-shirt of the particular bungee site is included. You can buy the jumps online, on the phone or on the spot. If your time is limited and you aren’t flexible, make the booking in advance because the sites are very busy. However, sometimes the dates showing as sold out online can be available locally but you can’t count on that. We were lucky and managed to get all the bookings sorted on the spot. 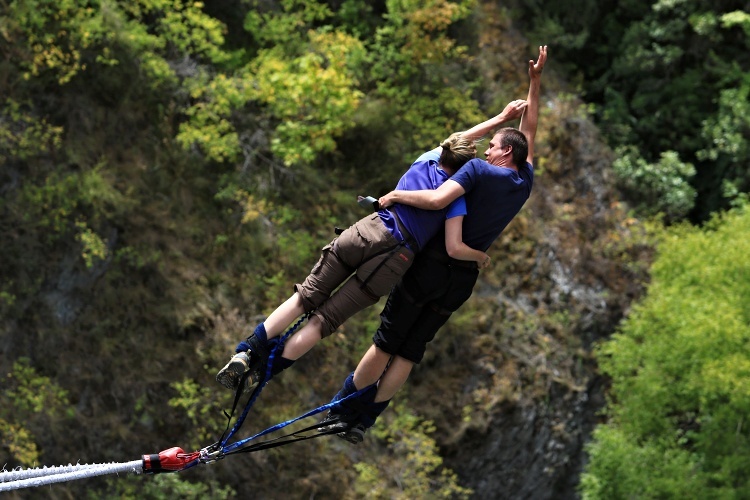 If you feel that you can’t do it on your own, consider a tandem jump that is available at the Kawarau Bridge Bungy Centre. It really helped Kat to get a feel of what it was like and she managed to jump on her own in Auckland afterwards. We recommend going for the water touch option if possible – it doesn’t hurt at all and it’s so much fun, you will be glad you did it. Expect to be nervous – very nervous. But that’s ok, everyone is anxious (unless they are crazy!) and you will see the fear on other people’s faces. It’s all about overcoming your fear and you will learn a lot about yourself from this experience. Don’t think about the way you jump too much and just listen to the staff who will guide you through the process and will try to make it easier and more fun for you. Talk to the staff about anything – it will occupy your mind for a while. They are very professional and friendly and will look after you and your safety well. Don’t forget to smile for the cameras when you are told – you will be so proud of these photos and video later on. Try to calm your nerves and concentrate on the voice of the staff when they start the countdown. If you think too much about what you are going to do, your mind can stop you from jumping. Just do what they say – you have already come so far. When they say “Jump!” – jump or just lean forward and the gravity will help you. But bungee jumping is not for everyone – do not do it if it scares you too much because you won’t enjoy it. Don’t let anyone push you to do it if you don’t feel good about it. Do it only if you really want to. 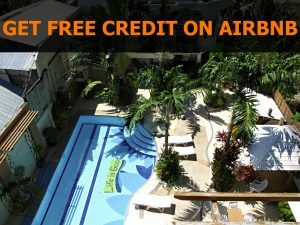 You can start with a zip ride or a swing and see how it goes first, or you can just watch others and enjoy the atmosphere – choose whatever is the best for you. Have fun!